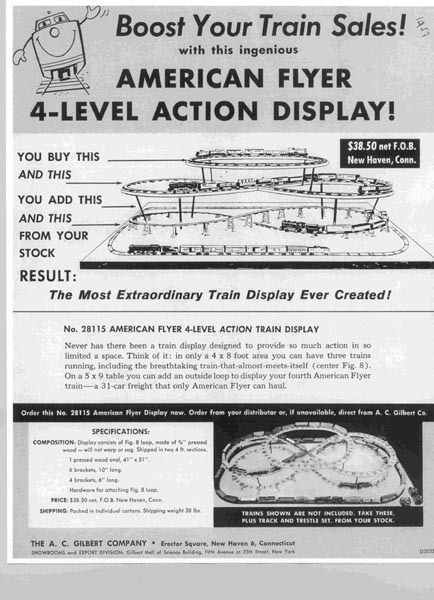 1957 American Flyer 4-Level Display Info (D2033). Mint Condition. - $3.00 : Olson Hobbies, Welcome To The Train Page! 1957 American Flyer 4-Level Display Info (D2033). D2033 American Flyer 4-Level Action Display Sheet. This was put out by the A. C. Gilbert Co. to promote dealer sales in the late 1950's, showing a 5 X 9 foot display with 4 loops of Trains. The display consists of a Figure 8 loop made of 3/4" pressed wood, and 4 operating trains. Price of layout was $38.50 FOB New Haven Conn. This is a 8 1/2 X 11 inch ,gray, black-and-white copy from an original in my collection. It was reproduced on heavy bond white paper.